When people find out that you homeschool they sometimes react with awe. “I could never do that!” they say. And then they ask you, “Don’t your kids drive you crazy?” You want to be a good homeschool ambassador so you tell them “No, of course not.” And then you talk about how blessed you are or how wonderful your children are. If you’re feeling a little more honest you might tell them, “Sometimes they drive me crazy.” But you always make a point to assure them that you enjoy the homeschool life you’ve chosen. Let me be really honest for a minute. Yes, my kids drive me crazy. Totally nuts. Absolutely bonkers. I am certain that I have lost my poor little mind. 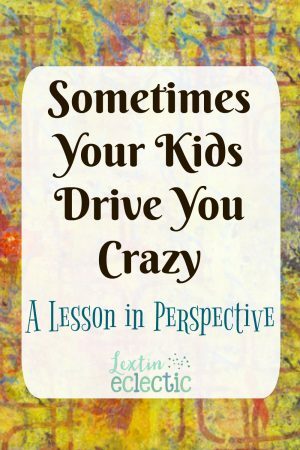 I am a homeschool mom and I am admitting that my kids are driving me crazy. Ok, so they don’t make me nuts all the time. It’s only part of the time. Maybe only 4 or 5 times a day. That’s not every minute! So, there are times that I feel totally sane and totally in love with this homeschool life and I feel over the moon in love with my kids. Other times I just don’t. I’ve been thinking about what makes a difference in those times. Why do I just want to squeeze and love on my kids one minute and then want to pack them off to Timbuktu another? I’ve had a realization. It really has nothing to do with my kids. It really has everything to do with me. My attitude is wrong. Usually when my kids are making me want to plead an insanity defense, I am having a day where my attitude is not where it should be. Maybe I’m frustrated at my kids for something and I’m not handling it correctly. Maybe I’m frustrated with myself. Or maybe I’m frustrated with a situation that is outside of my control. I could be feeling discouraged, anxious, angry, or just plain tired and worn out. No matter the reason, I’ve discovered that it’s my attitude that is out of place, and when it is I seem to be searching for things that my kids do that drive me crazy. I’m already in a bad mood and I’m just looking for what seems to be a tangible reason to lose my temper or my mind. And when my attitude stinks, I turn toward the easiest source to blame – the 5 loud and crazy little people who have to spend all day with me. I don’t view my children as God does. It shouldn’t be easy to forget that children are sinners and need daily forgiveness and guidance. But despite their disobedience, surly attitudes, and tattle-tale stories, I somehow think that they should know better, act better, and just be better than that. Why on earth do they do the things they do? What are they thinking? They are just acting human and they deserve grace. When my kids are driving me crazy I’ve realized that I’m not viewing them through God’s eyes. They are precious; they are a blessing; and they need a huge helping of grace. When I change my perspective to see them as beautifully broken human lives who are unrelentingly loved by God the Father, I feel a surge of love and affection toward them that is super natural. God loves them unfailingly despite their tendencies to drive me crazy. Shouldn’t I also? I’m not being proactive. When I’m not setting the pace in our house whether in our schedule, in our Bible times, or in our attitudes, everything falls apart. In those times my kids make me frustrated and angry. They are drifting aimlessly without a schedule, without consistent expectations, without a structured approach and they have lost their little sense of security. That’s when they act crazy and do mind boggling, dumb, and attention getting actions. When I’m busy or when I think I’ll do other things or when I have my priorities backwards my kids suffer for it, and they do everything they can to remind me of their presence – rarely in a positive way. I’m learning to wake up each morning and implement an attitude adjustment before I even cross the threshold of my bedroom. I take some time to turn my heart and mind over to the Lord and ask Him to give me the strength, joy, peace, and will to make it through another day. And at the end of that day I want to know that I’ve done more than survive, I’ve bowed to His will for me and I’ve captured each moment, noticed every blessing, and nudged hearts more toward Him. I’m learning to picture my children through the lens of Christ’s unconditional love. I don’t expect perfection from them and I already have grace ready to extend for the times when they mess up – because they will make mistakes over and over again. But just like God forgives my continual failings, I can forgive theirs while showing them a tiny picture of Christ’s unfathomable mercy. I’m learning to put aside the things that are less important – like the technology and trivial busyness that threatens to take up my time. I’m finding that I should focus on the ministry that God has given me for this season – the ministry of discipling my family and reaching their hearts for Him. I am working to be proactive in letting them know expectations, showing them the correct way to respond, and having an availability for them so they know they have my attention even in the little things. So on days when my kids have driven me up the wall I think about why that wall of impossible expectations, frustration, and discouragement is actually there. And then I remember that I’m the one who built that wall. That’s when I adjust my attitude, seek the mind of Christ, and take a proactive stance in ministering to my children. Then I climb down the wall and issue out forgiveness while also asking for some for myself. Yes, my kids still drive me crazy but I’m reminded that it’s usually my fault for allowing the crazy to get to me. I loved this!! As a home school mom I have to admit sometimes my kids drive me crazy too. And usually that happens because of my attitude! Yes, yes, yes. Thanks so much for these wise words. My kids often drive me crazy, but it's usually 100% preventable on my part! precisely…our perspective makes a big difference. 🙂 I ruefully admit that to my boy too often….. This is an amazing and heartfelt post…full of lessons I need to apply to my own life! 🙂 I often need to go back and re-read this post for myself. Some days are just so hard! Thank you for your kind words! When we change our attitude and perspective it really helps. It’s easy to blame kids but often I find that I’m the one in a bad mood.